The Akalis are the most enthusiastic members of the Sikh faith. 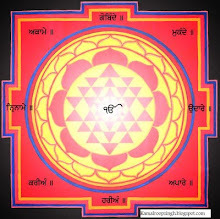 Their origin dates from the time of the tenth and last Guru. Their name is derived from one of the epithets of God, Akal,* the eternal or immortal, a word which they are supposed to frequently ejaculate. They wear a blue dress and lofty turbans which they call dumbala or high-tailed. These turbans are ornamented with steel discs or quoits, daggers, and knives. The Akalis appear to employ their turbans as our ladies employed chatelaines a few years ago, namely, to carry handy domestic article of frequent use. In au Urdu paper prepared far me by one of the chief priests of the temple, the Akalis are styled the most ignorant, cruel, and rapacious of the followers of Gobind Singh. But they would, in case of necessity, prove brave and determined soldiers, and devote themselves to death as of yore in the cause of the holy Khalsa. Most of them professedly adopt celibacy in which, however, chastity is not always au appreciable factor. And the few who are married are not capable either by their influence or the purity of their lives of retrieving the reputation of their much defamed monkish brethren. In most of the exoteric observances of the Sikhs a deep purpose may be traced. When fighting was part of a Sikh's duty, it was deemed necessary that his head should be properly protected with steel rings; and long hair with knives concealed in it protected that part of the person from sword-cuts. The kachh, or drawers, fastened by a waisthand, was more convenient and suitable for warriors than the insecurely tied sofa of general Indian wear. A Sikh's physical strength was kept intact by the use of meat dreaded by the Hindus ; and, the better to assist in this object, he was enjoined to abstain from the pernicious drugs, tobacco and bhang, then so freely consumed by both Hindus and Musalmaus. Among the religious orders of the Sikhs in the Panjab, the Akalis may be said to preserve whatever remain of the customs of the last Guru. When they marry, they do not, like the other Sikhs, call a Brahmin to perform the nuptial ceremony. A Sikh priest is summoned. He reads the Anand, or epithalaminm, composed by Guru Arjan Das. A sis then thrown over the bride and bridegroom, the well-known chadar dalana marriage ceremony of the Panjab. The holy Granth is used as awitness on the occasion, instead of fire, which is an invariable concomitant of Hindu marriage ceremonies. Karaparshad is then offered to the Granth, and distributed among the guests, after which the ceremony is complete. The Sikh priest who has favoured me with this information, considers this marriage knot superior to the elaborate one of the Hindus. It is cheap, simple, and equally efficacious! Not only in the matter of marriage, but of other ceremonies also, is the Akali still more intelligent than his co-religionists. He does not, by piercing his ears and wearing ear-rings, render himself effeminate, or give a handle of attack to his enemies if ever engaged in close combat. When any of his friends dies, he does not call a Brahmin to read the mortuary service, or heap upon him a large recompense for his idle ministrations. The Akali, instead of this, bestows alms on poor Sikhs, and he collects his friends to read the Granth with him, and pray that the soul of his deceased relation may be speedily relieved from transmigrations. The strictest of the Akalis have acquired the epithet Bibekis the discriminating, or the conscientious. These have engrafted all the prejudices of Hinduism on the bigotry of the Akalis. With all the irrational asceticism of the Vaishnu sect of Hindus, the Bibekis will not eat flesh or even partake of any article of food or drink which they have not prepared with their own hands. To such au extent is this carried, that they will not even taste food cooked by their wives, eat fruit purchased in the market, or drink water which they have not themselves drawn from the well. They consider it a sin to eat bare-headed, and will pay a fine (tankhah) to the temple if they do so even inadvertently. They do not remove hair from any part of their persons. For the Hindu janeo, or Brahminical thread, they wear a sword. They are very strict in wearing the five articles of Sikh dress, whose names begin with a K. They will not drink water without immersing in it a knife or dagger. And, with an irrational mixture of spiritual pride and spiritual humility, they think themselves equal to the tenth spiritual king, Gobind, while at the same time they acknowledge themselves his disciples. The asceticism of this class not only extends to these bigoted observances, but also to their ordinary conversation. They add the word " Singh," which is peculiar to the Sikh religion, as an affix to all substantives and sometimes to other parts of speech. For instance, instead of saying, '' Put the inkstand on the table," they say " Put the inkstand Singh on the table Singh." Another verbal peculiarity of theirs may be mentioned. It is well known that in Hindustani, as in French and Italian, all substantives are either masculine or feminine. The Bibekis, with pharisaical ostentation, never use a word of the feminine gender. If an object can only be expressed by one word which is feminine, they alter its distinctive termination. 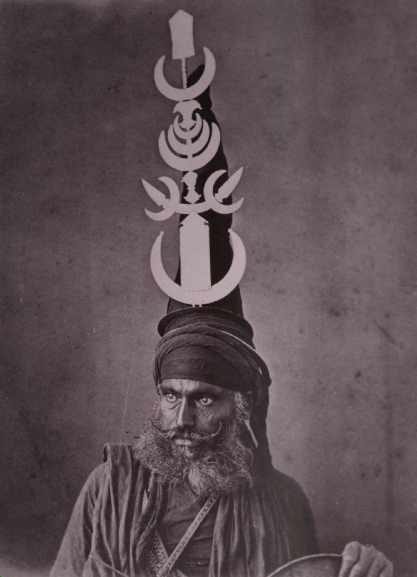 Thus the word kanghi, a comb, in such frequent use among the Sikhs who religiously wear long hair, is grammatically feminine ; but when a Bibeki has occasion to use the word, he says Kangha, changing the final feminine into a masculine vowel, thus altering the gender of the word, and religiously and prudently preserving himself "from the contact or presence of even feminine substantives. Some of the Akalis call themselves Nihangs. It is said, that one day there appeared before the tenth Guru an Akali in a lofty turban to which were attached miniatures of all the weapons of warfare employed at that period. The Guru was pleased and said, that the man looked like a nihang or crocodile. The Guru saw that the turban gave a ferocious appearance to the religious warrior, and forthwith recommended it to his followers. The high-peaked turbans of the Nihanga are said by others to have had their origin in one of the marauding expeditions of Zama'n Shah against the Sikhs. The latter on one occasion were few in number and unable to cope in fair fight with their adversaries. They therefore put on the high-peaked turbans of the Turki soldiers, went armed among them at night, and completely destroyed them. The high turban was therefore permanently adopted as an auspicious article of costume. A third more probable account, however, is that on which the Sikh priests themselves appear to be generally agreed, namely, that the custom of wearing high-peaked turbans was first adopted in the time of Ranjit Singh. Phola Singh, a man of prodigious stature, used to sit daily in the balcony of the Akal Bunga. His gigantic size appeared enhanced by his high-peaked turban ; and his advice and example induced other Akalis to adopt a similar head-gear. It soon became one of the distinctive articles of dress of their order. The more insolent of the Akalis and those addicted to the use of intoxicating drugs, appear to have appropriated to themselves the designation Nihang. The word is in such bad odour in other parts of the Panjab, that a man is styled a Nihang who has taken to vicious ways and bad livelihood. All European travellers in the Panjab during the Sikh regime have complained of the gross insolence, and in some cases of the foul language or maledictions employed by these Nihanga, or Akalis, to Christians. No such thing has, I believe, ever been witnessed in recent times. Several of the Akalis still have, no doubt, a defiant air, but all of them with whom I have conversed I found uniformly courteous and civil.